Jan Toorop (also known as Jean Theodoro Toorop or Johannes Theodorus Toorop) was a Dutch Symbolist painter with a wonderfully unique style. He was born in Purworedjo, Java, at a time when Java was a Dutch colony. Ne moved to the Netherlands in 1872 and studied in Delft and at the Rijksakademie in Amsterdam. Toorop’s work fits loosely into the category of Symbolist painting (a bit of a grab bag to begin with), as well as Art Nouveau. At times in his career he flirted with various styles, including Realism, Impressionism, Pointillism and Applied art. His paintings combined both European and Javanese elements and aesthetics. The long thin arms of the figures in the image above, bottom, are indicative of Javanese shadow theatre. 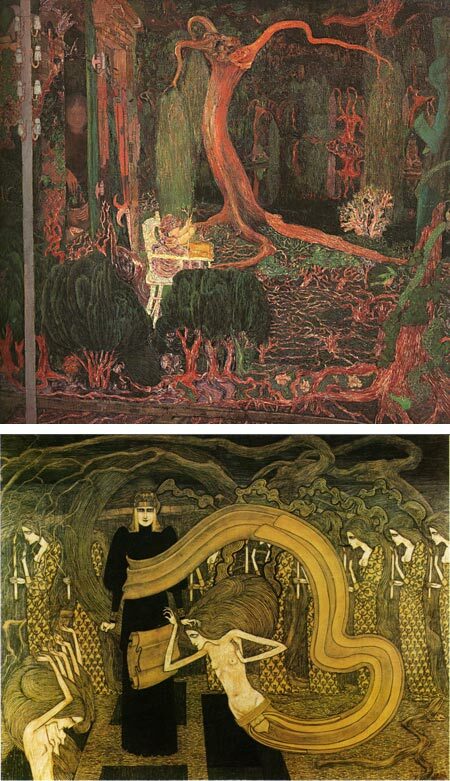 In The Young Generation (image above, top), we see Toorop’s young daughter, Charley, seated in her high-chair, arms outstretched toward the strange and wondrous world that beckons her. Charley Toorop would also become a respected artist, as would her son. In addition to his gallery work, Jan Toorop also created book illustrations, posters and stained glass designs. There is an extensive site devoted to the artist, The Jan Toorop Research Center, which has a comprehensive gallery of his works, arranged by year, along with a bio, writings and section devoted to his experiments with different art movements.